The Annual Development Status Update is now available! In 1964, the President's Appalachian Regional Commission (PARC) reported to Congress that economic growth in Appalachia would not be possible until the Region's isolation had been overcome. Because the cost of building highways through Appalachia's mountainous terrain was high, the Region had never been served by adequate roads. Its network of narrow, winding, two-lane roads, snaking through narrow stream valleys or over mountaintops, was slow to drive, unsafe, and in many places worn out. The nation's interstate highway system had largely bypassed the Appalachian Region, going through or around the Region's rugged terrain as cost-effectively as possible. The PARC report and the Appalachian governors placed top priority on a modern highway system as the key to economic development. As a result, Congress authorized the construction of the Appalachian Development Highway System (ADHS) in the Appalachian Regional Development Act of 1965. 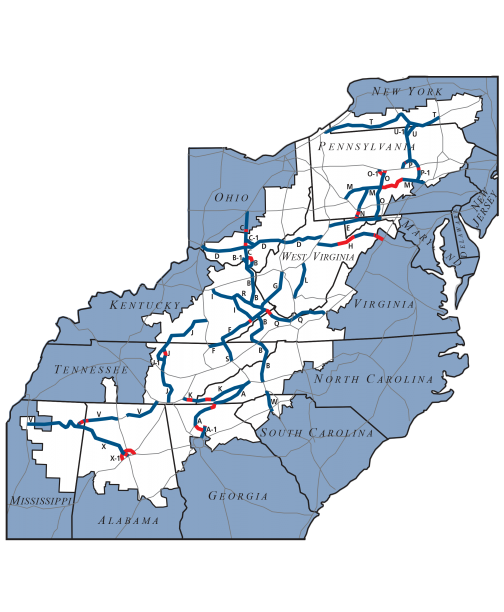 The ADHS was designed to generate economic development in previously isolated areas, supplement the interstate system, connect Appalachia to the interstate system, and provide access to areas within the Region as well as to markets in the rest of the nation. The ADHS is currently authorized at 3,090 miles. By the end of FY 2014, 2,549.3 miles—83 percent of the miles authorized—were complete, and 213.6 miles were under construction. Many of the remaining miles will be among the most expensive to build. Completion of the ADHS remains a top priority for ARC.